Olay’s Regenerist Luminous Skin Tone Perfecting Cream Moisturiser was the product I reviewed on Monday. If you’re interested, you can read the review >>here<<. 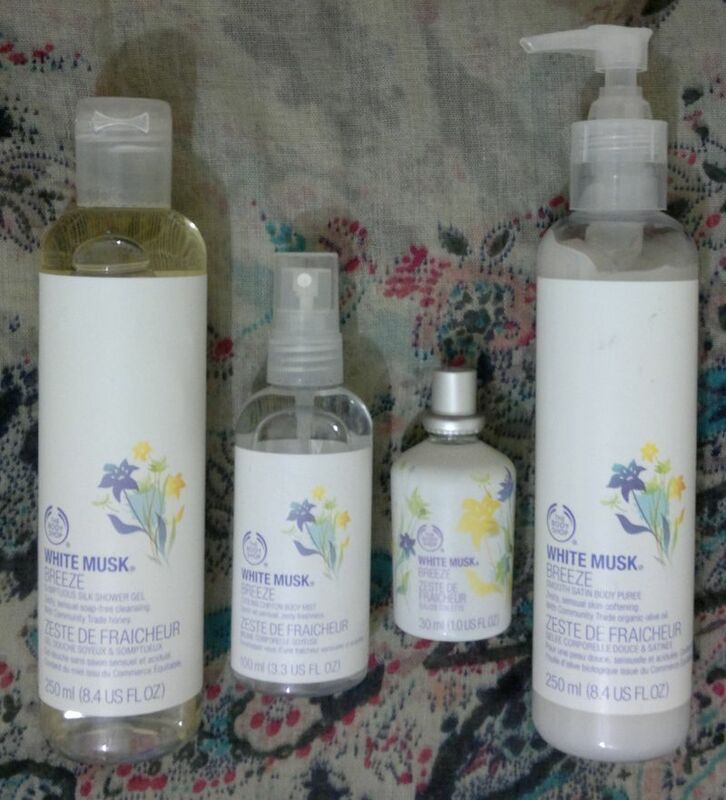 On Tuesday I reviewed The Body Shop’s White Musk Breeze body products. You can read the post >>here<<. Wednesday’s post was about Boots’ Radiance & Brightening sheet mask. If you’d like to read the post, >>click here<<. Thursday’s post was a Nail Of The Day post. 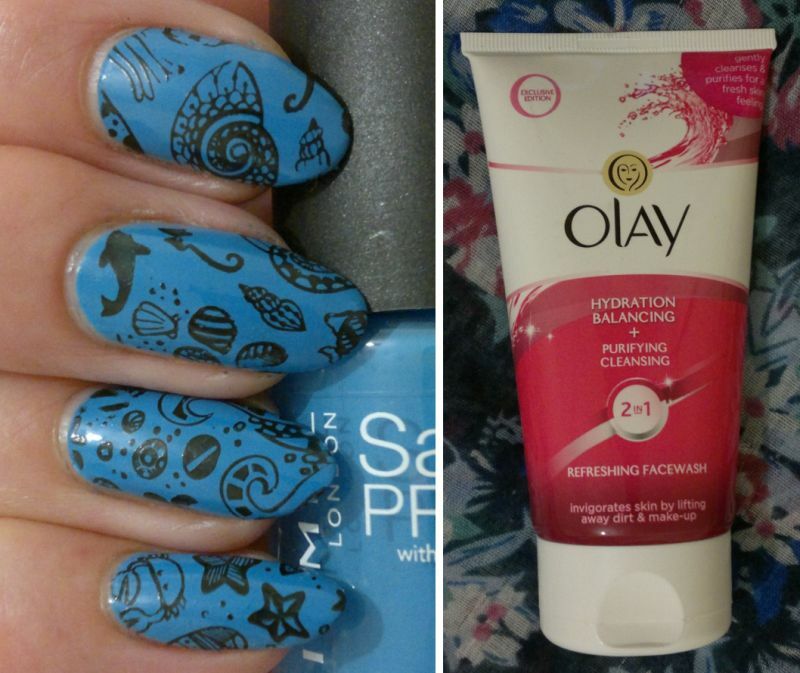 >>Click here<< if you’d like to know which products I used for this mani. On Friday I wrote about my 7 favourite products in April. If you’d like to read the post, >>click here<<. Hi there! And welcome to this month’s Beauty Awards! April 2017 is almost over, so it’s time for my monthly favourites post. As always, I’ve chosen 3 favourites of all the products I’ve reviewed this month, and I’ve also thrown in a few honourable mentions. Now onto the favourites! I only paid £1.45 for this Olay face wash, so I’m extremely happy that it turned out to be such a fantastic product! 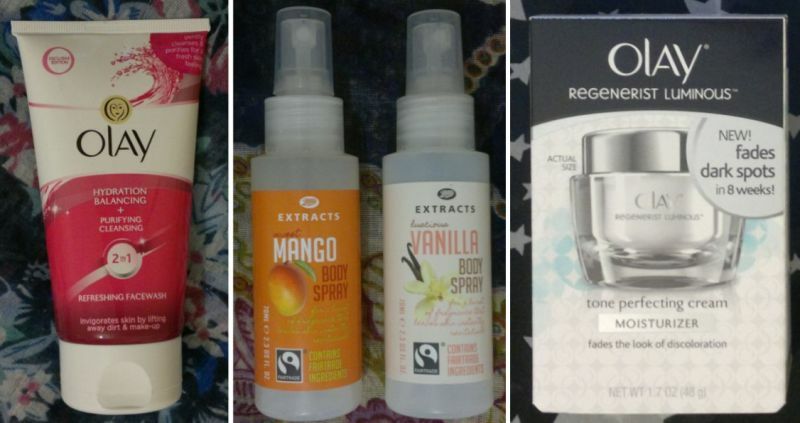 I also love these two Boots Extracts Body Sprays. They smell great! 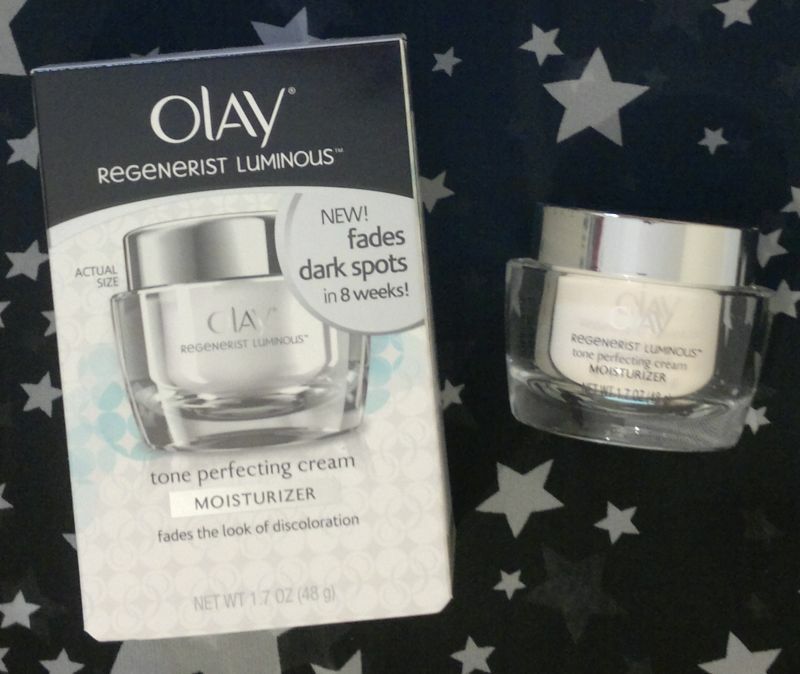 Olay’s Regenerist Luminous Skin Tone Perfecting Moisturiser is just great. I already bought a back-up! Now onto the honourable mentions! I really enjoyed Montagne Jeunesse’s Buttercream Dream Mud face mask, and I think Superdrug’s Yoghurt Smoothie Mask is very good too. 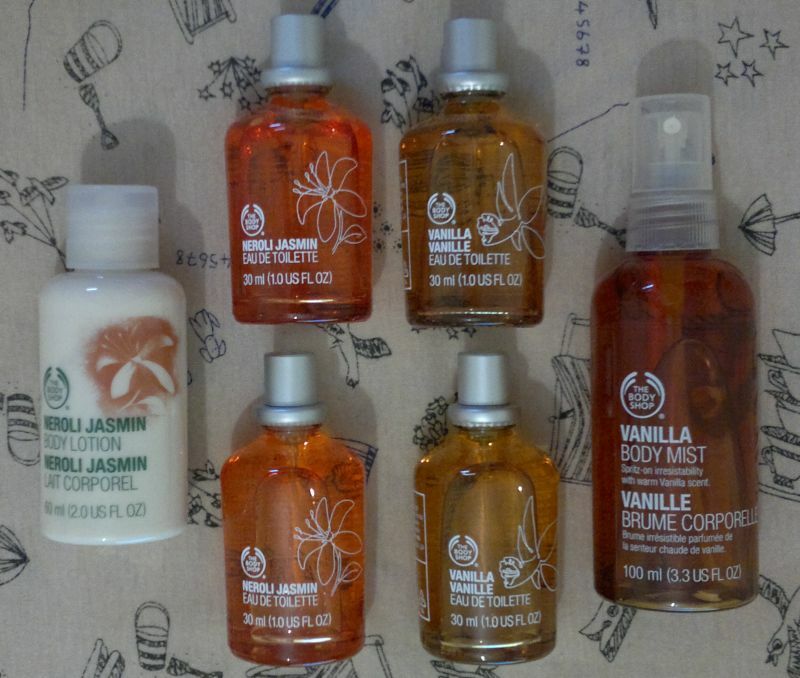 I Love…’s Yummy Caramel products were a nice surprise, and L’Oréal’s Skin Perfection Correcting Concentrated Serum is another good product that’s worth mentioning. Hi there! I’ve got another short Nail Of The Day post for you today. 🙂 For this mani I painted my nails with Essence Out Of Space Stories 01 Outta Space Is The Place (two easy coats). The stamping plate I used is Pueen’s 80 plate (which is available as part of Pueen’s Buffet Leisure collection). 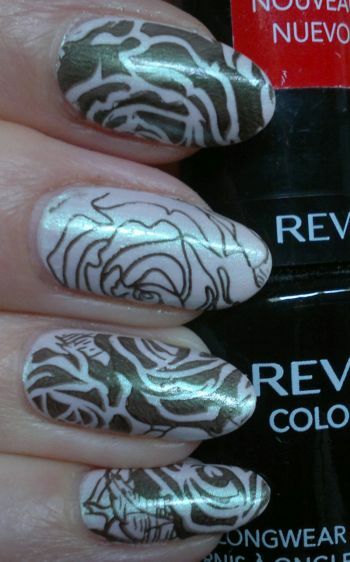 And the polish I used to stamp on the flowers is the one and only Revlon Colorstay 270 Stiletto. This mani also counts towards the 31 Days Nail Art Challenge – and it’s for challenge #14 Flowers. Hi there! 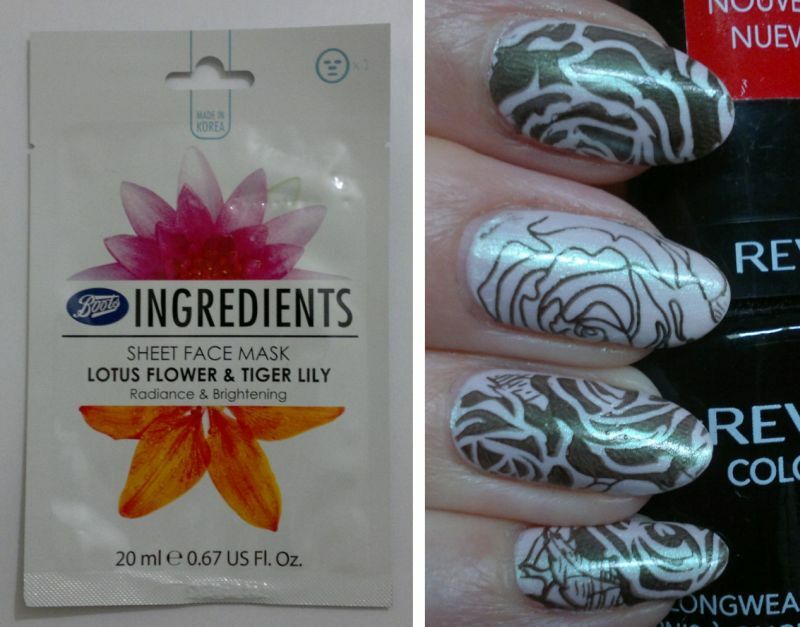 Today I’m reviewing Boots’ Ingredients Radiance & Brightening Sheet Face Mask with Lotus Flower & Tiger Lily. This face mask promises to leave skin “shining with radiance and looking brighter” – in 15 minutes. So how’s the mask? I didn’t notice any difference. I had the mask on for almost 45 minutes, but it didn’t seem to do anything for me. I’ve also used the leftover product from the sachet as a night serum for a few days. However, I still didn’t notice any difference at all. It’s also not great that this mask fits extremely poorly. It looks like it was made for Stewie Griffin. My friend Stashy captured it perfectly. Based on my experience I wouldn’t recommend this face mask. 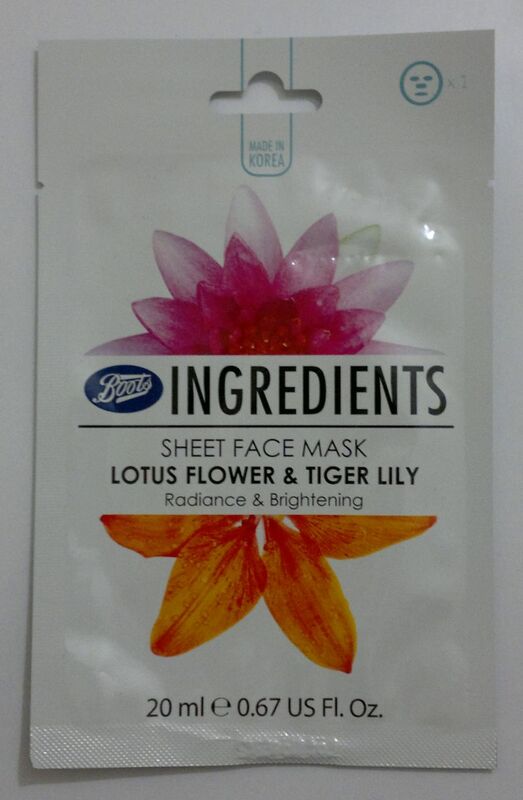 However, if you’re interested… Boots Ingredients Radiance & Brightening Sheet Face Mask with Lotus Flower & Tiger Lily is available for £2.50 at Boots. I got my Ingredients face masks when Boots ran a 2 for £3 promotion. So don’t forget to check for offers before you buy! The Body Shop’s White Musk Breeze Shower Gel is alright. It lathers up nicely, but it doesn’t feel drying. I also like the fragrance – it’s white musk and jasmine. The Body Shops’s Body Purée (which I have 2 bottles of) is good too. The fragrance is a little fresher – it’s white musk, jasmine and a mix of refreshing citrus fruits. However, I have to say that I don’t love the purée formula because it feels a little sticky on my skin. Now onto the fragrances! The Body Shop’s White Musk Breeze Body Mist is a decent all-over body spray. It’s a little lighter and less dense than the EdT. I like it! I’m sure I’ll be able to finish this bottle at some point. The Body Shop’s White Musk Breeze Eau De Toilette (which I have 2 bottles of) is a true white musk fragrance. It starts out fresh but the citrus aroma evaporates quickly. Now onto the conclusion… I’m impressed that these products didn’t go off. I really, really love preservatives in cosmetics and toiletries! 🙂 OK, here’s the actual conclusion… whilst I like these White Musk Breeze products, the white musk fragrance isn’t my favourite. I’m sure I’ll be able to finish the shower gel, the 2 (!) body purées and the body spray. We’ll have to see whether I’ll finish the 2 (!) EdT bottles. Let’s see if I can make an effort to use the EdT on a regular basis. Fingers crossed! So based on my experience I’m satisfied that this Olay moisturiser does quite a lot! Yes, it exfoliates, and it does make my skin feel smooth. And I have no doubt that it somehow regenerates my skin’s appearance because my skin does look fantastic now! Thank you, Olay! I would definitely recommend Olay’s Regenerist Luminous Skin Tone Perfecting Cream Moisturiser. It’s £29.99 for 50ml, so it’s one of Olay’s most expensive products. However, I only paid £14.99 (half price offer). So don’t forget to compare prices! Oh, and I’ve already bought a back-up which, by the way, was only £9.99. Hi there! Today’s post is my weekly blog recap. If you’ve missed a post that you might have liked, this is your chance to catch up. Monday’s post was a Nail Of The Day post. Click here if you want to read it. 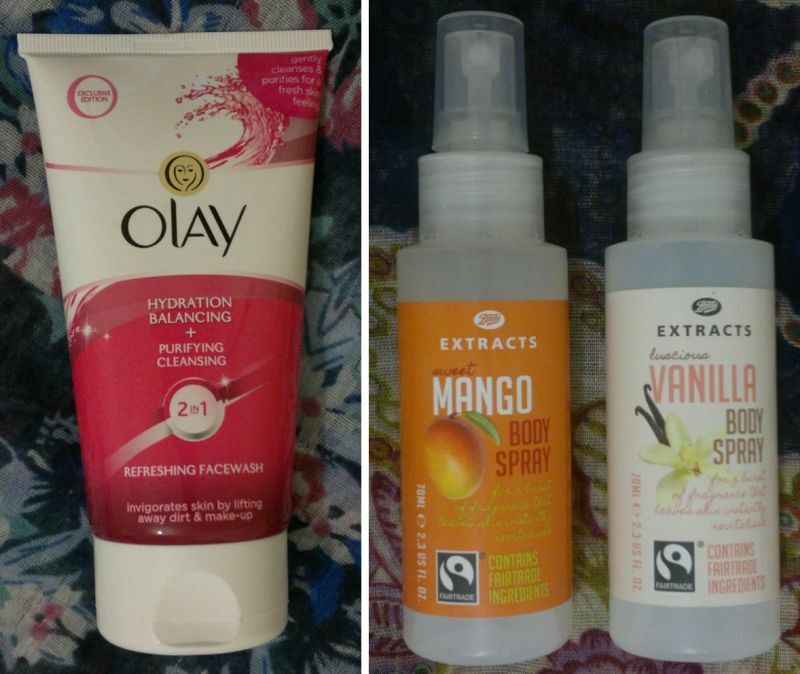 And Tuesday’s post was about Olay’s 2 In 1 Refreshing Face Wash. If you’d like to read the post, click here. 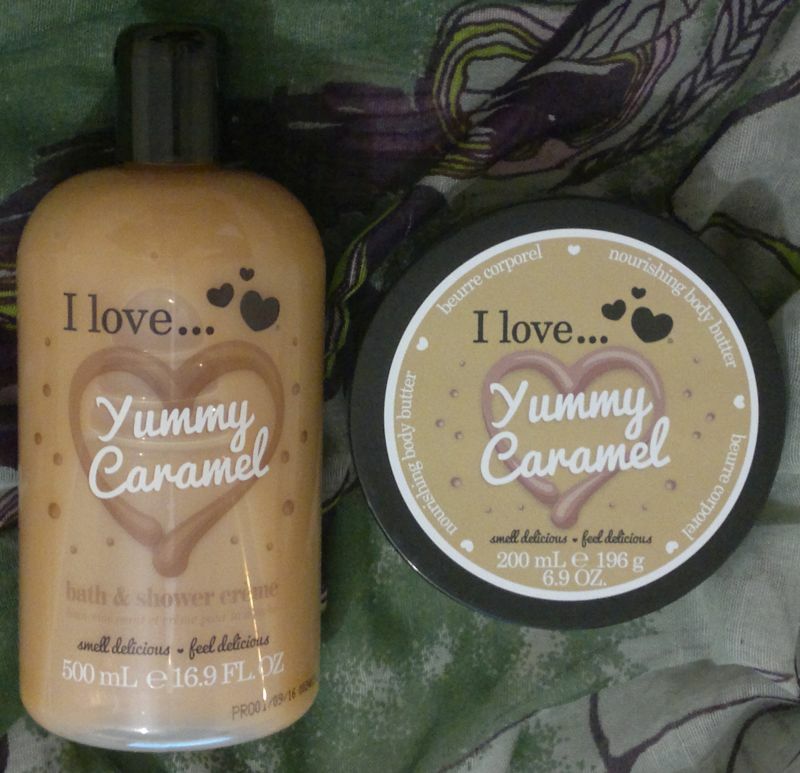 On Wednesday I reviewed I Love…’s Yummy Caramel products. Click here to read the post. 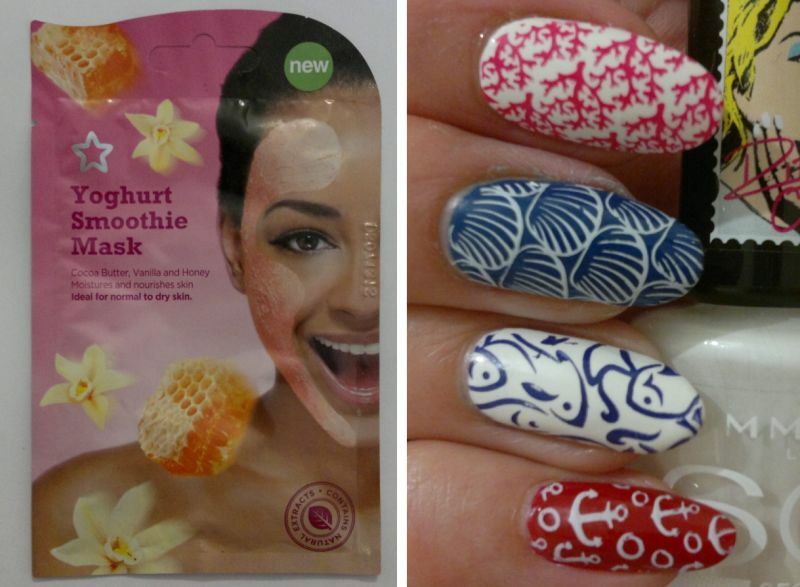 Thursday’s post was about Superdrug’s Yoghut Smoothie Mask. Click here if you want to read the post. Friday’s post was another Nail Of The Day post. If you’d like to know which products I used for this mani, click here.